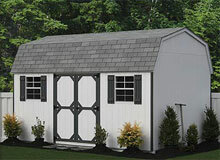 You may choose from three distinctive styles that lend practicality as well as beauty to any site. Each building sits on 4" x 4" pressure treated skids. 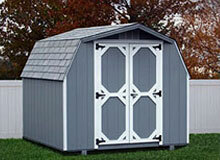 Each has 5/8" under lament plywood flooring and 5/8" exterior siding. 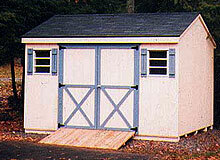 The 2" x 4" joists and sidewalls are 16" on center. 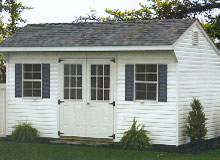 Exterior sheeting is covered with a 20 year asphalt shingle. 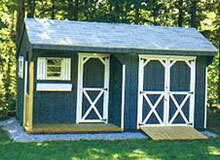 The sheds are available in a variety of colors to complement your home and property. 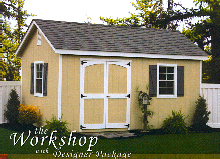 Millbrook Farm Woodworks also offers an exclusive line of sheds including our customized potting and drive-thru snowmobile or garden tractor sheds. 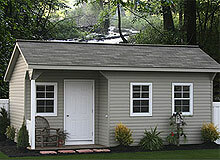 More information of the Sheds to come soon.